Texanation – A state of mind created by those who believe in uncompromising principles of right and wrong, where justice is done and the bad guys lose. A place where individuals take responsibility for their lives and their families, where character trumps skin color, and neighbors take care of neighbors. 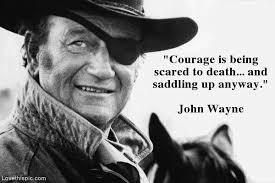 Here in Texanation we are guided by the answer to this question: What would John Wayne do? Click the header titled “And Then He Said” only if you’re willing to face the consequences, Pilgrim. I’m a writer, reader, father, husband, and wiseass. The links on the side will guide you gently to my published works, and this link will take you to my blog musings. Published works include the novel, Yeager’s Law and Yeager’s Mission. April’s Fool, and Working Stiffs, as well as short stories in both anthologies and online publications.